As the weather cools I begin to search for my seasonal fall vegetable recipes in my crowded over-stuffed shoe-box. Believe me it almost takes the entire afternoon to do this. Someday, I promised my kids I’ll try and scan them into an organized file. 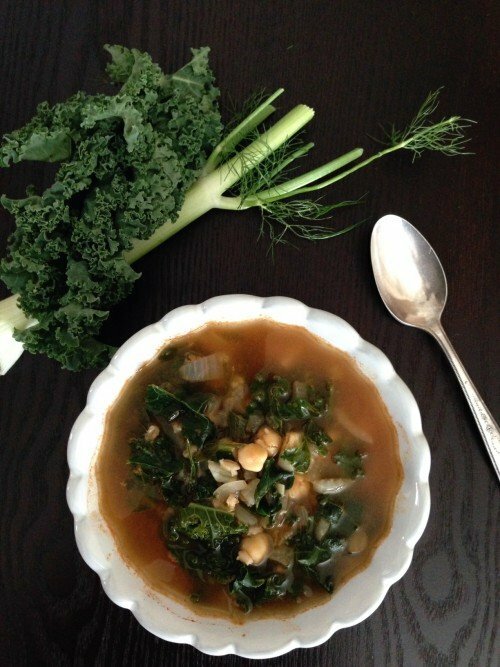 One recipe I turn to is my Chickpea Soup with Kale and Barley. When it turns cold outside I begin to use up all my summer pantry ingredients and shop for more seasonal and more hearty vegetables. As your plan out your weekly meals, I have compiled a short list for you in preparation for a colder season ahead. If you decide to cook fresh chickpeas, check out my cooking techniques for chickpeas. I cook up a pound or two on the weekends and freeze the remaining beans for hummus and soups. You can find my homemade vegetable stock as well on my blog, for those of you who are interested in developing your own freshly made stock. For a last touch to your soup try and add a splash of lemon! Try adding this soup to your recipe box for a nice fall dish for your family. Replace what you have in your cupboard for the grains with pasta or rice. Make your vegetable stock and set aside. Or purchase boxed or canned stock . Place 2 cups of of water on to boil and add the barley. Cook until tender. Drain. In a large pot, heat the oil over medium heat. Add the onion, garlic and cook until vegetables are tender, 5-6 minutes. Add the chickpeas, tomatoes, broth, fennel seeds, pepper flakes, parsley and rosemary. Bring the soup to a boil, reduce the heat and simmer around 30 minutes. Add the cooked barley and kale and cook until tender. Add the lemon juice before serving. Save the cooking water from the barley, pasta, or rice you are pre-cooking, for extra liquid you may need for the soup. © 2013 – 2019, Mary Papoulias-Platis. All rights reserved. Another winner from you, Mary! That looks fantastic! We’re going to share it on social media on Thursday, and link here. Thank-you for the post on Thursday! We just sat down to enjoy our soup- with a big green salad! Looking forward to seeing your amazing seasonal fall products, Cut’N Clean! What a great soup: healthy and full of fibre!! Altho’ spring has truly sprung in my part Down Under, I still make such soups especially for evening meals. Methinks the rosemary and fennel are the big taste ‘lifters’ here 🙂 ! Hi Mary! What a wonderful contribution to the Meatless Monday campaign! I’m making a real effort to participate this autumn, and I usually have the hardest time finding a soup that’s filling enough to be a meal. THIS IS IT!!! So thank you. It’s on the list for me to try, soon. Definitely storing extras for lunches in the office. Hi Kim, It’s so good to hear from you! This is one of my favorite soups. When cooking the barley or rice, pasta choices save the water in case you need more for the soup- tasty! Hope to see you soon! is there diced fennel in this recipe? it is not listed in the ingredient list (fennel seeds are). but i see diced fennel mentioned in the directions. thanks! So sorry for the error with the fennel. It is only fennel seeds. I love this soup and I hope you try it! I'm Mary at California Greek Girl. Find me at the beach, planting the latest veggies, or chopping away at new healthful recipes. Stay awhile and enjoy my site.